Are all the Mack Golf clubs still closed down? 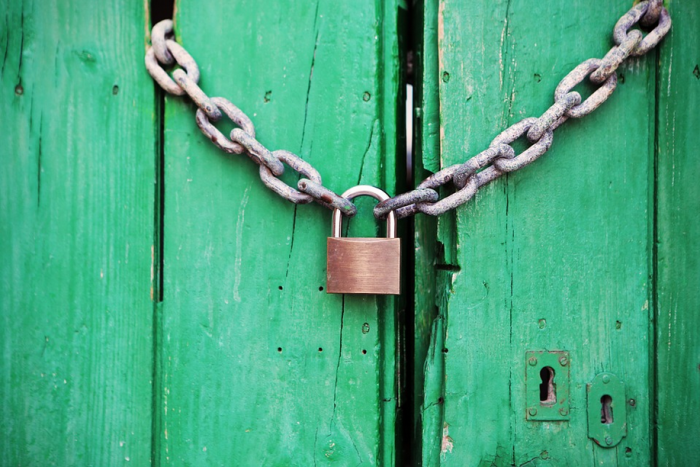 In October Mack Trading, which operated eight former municipal golf clubs in England and one in Ireland, ceased trading, risking the futures of all the golf clubs. Five weeks on, we can reveal that three clubs have been saved and have reopened, one is open as its council is trying to find a buyer, two remain closed but their council is hoping to rescue them, one will remain closed for the next few months but could reopen next year and one, which was due to close anyway, will not reopen. Bowring Park Golf Course in Liverpool has been rescued and has already reopened. All five workers have been re-employed as Knowsley council looks to find a permanent operator. The council is now going to tender for a permanent operator for the course and plans to find one by March. Powell said it would be “business as usual” for staff and golfers in the meantime. 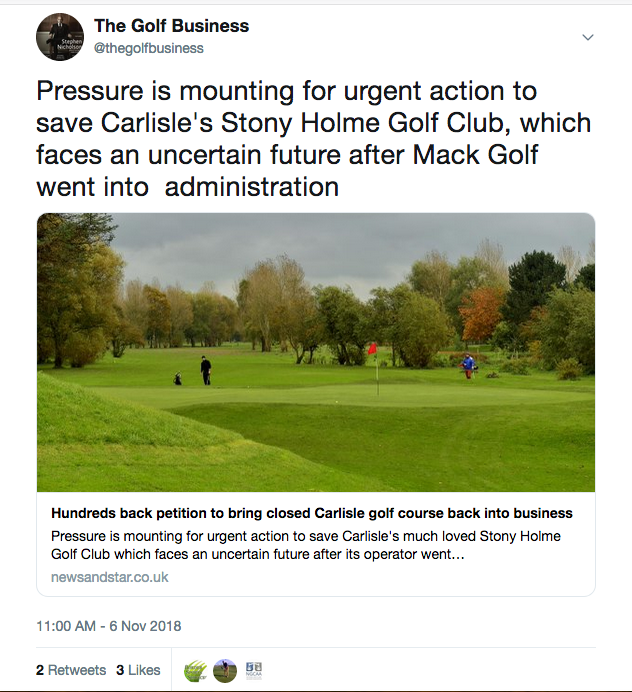 Ellesmere Port Golf Course (also known as Hooton Golf Club) and Knights Grange Golf Course in Cheshire’s future, meanwhile, are in limbo but Cheshire West and Chester Council has said it hopes they will be back up and running ‘as soon as possible’. The council is currently in the process of ‘assessing the best options’ to get the clubs operating once more. The council has also revealed it has served notice to Mack Trading, the owner of Mack Golf, terminating their leases. “We have received notification that Butcher Woods has been appointed as liquidators for Mack Trading. Consequently, and to return the Hooton and Knights Grange sites to the council, the council has served notice to terminate lease and other agreements,” it said in a statement. “The council has immediately made arrangements for the assessment of the condition of the sites and other related assets, and the commissioning of a greens and fairways maintenance regime. Heaton Park Golf Course in Manchester has been saved after a company stepped in to run and manage the course until next year. Manchester council appointed Green Circle Estates to run the course on an interim basis until the end of October, 2019. The council said the company would manage the courses on its behalf. 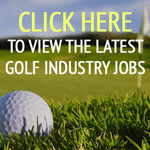 The firm currently runs three other local authority-owned golf courses – Allerton Manor in Liverpool, Kirkby Valley in Knowsley and Sherdley Park in St Helens. The council said the agreement would mean all current season tickets which run until December 31 this year can be honoured and that golfers would be able to purchase new season tickets from the start of January. And as part of the agreement, Green Circle will be offering job interviews to staff previously employed by Mack Golf, the council added. Helen Bamford, the company’s sales and marketing director, added: “We’re delighted to be working with Manchester city council and are pleased to be helping to keep these important and highly-valued golf and leisure facilities at Heaton Park open, to be enjoyed by the people of the city. Moors Valley Golf Course in Bournemouth has also been rescued. East Dorset District Council has said it will run the venue in-house. Councillor Ray Bryan, cabinet portfolio holder for performance, said the authority has worked closely with the insolvency practitioner to ensure a “satisfactory and timely solution”. “I am very pleased that the council has been able to react so quickly and effectively to this totally unforeseen occurrence,” Cllr Bryan said. The council will also introduce ‘health and wellbeing activities’ at the course. Stanley Park Golf Course in Blackpool is being run by the council while efforts are made to appoint a new private sector partner to secure its future. Its local authority has agreed to operate and maintain the course until March 31 next year, but in the meantime will consult with potential new operators. Staff will transfer to come under the umbrella of the council owned Blackpool Operating Company. Stony Holme Golf Course and Swifts Driving Range in Carlisle will not reopen in the short-term. 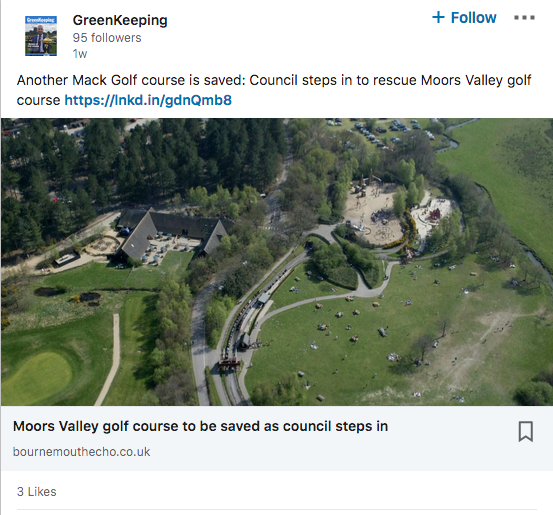 Local council leader Colin Glover said it would cost up to £75,000 to operate the course from November to April and the council had already committed its full budget to Mack Golf. “But if we can find a way to run the club and do it sustainably then that’s what we should do. Southwood Golf Course in Farnborough, which was due to close down in 2019, will not reopen. Rushmoor Borough Council has said the venue will cease to be a golf course, bringing forward plans to turn the site into green space and allow the building of housing developments in the borough. Previously the conversion was set to take place next year after the conclusion of Mack Trading’s contract, which was due to end in March. Councillor Maurice Sheehan said: “A number of matters are being worked through for the liquidation, but steps are now being taken to secure all premises and make the site safe. 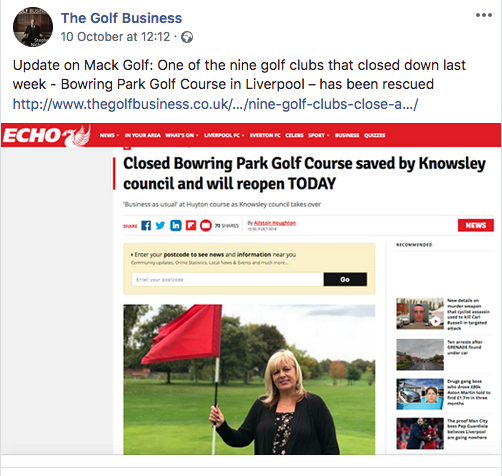 “Officers from the council met with the liquidator’s appointed asset valuation company at the golf course and have identified machinery and equipment that is owned by Mack Trading. Rathbane Golf Course in Ireland was also operated by Mack Golf. At the time of publication The Golf Business has been unable to find any information about its future – please leave comments below if you have any news (all comments by new posters are pre-moderated but usually approved within a few minutes).